If it were the '70's, I'd be taking a roadtrip to Possum Trot today. Sadly, now all that remains of this roadside attraction is a state historical marker. Imagine the guy whose job is was to tear that down and what must've been going through his head as he pulled up to this place. 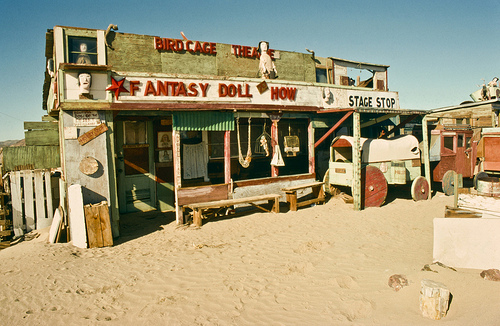 Located in the Mojave, near the ghost town of Calico, travelers on the old Route 66 could pull over and take in a "Fantasy Doll Show," which consisted of life-sized dolls, hand-carved by Calvin Black and outfitted by his wife Ruby, singing and dancing on a stage. Oftentimes, the dolls would perform to pre-recorded songs by Calvin (that's him singing on the video). 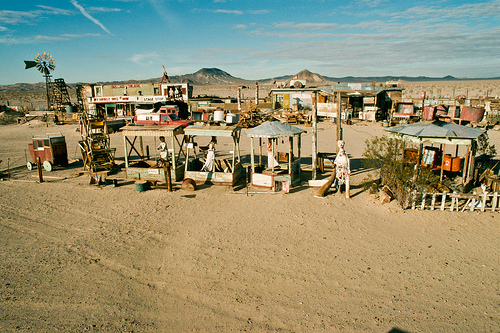 Originally, Calvin and Ruby ran a rock shop to lure in the passer-bys but it was Calvin's doll shows that took center stage. Each doll was created after someone special, and the dolls were treated as individuals. They had their own names, jewelry collections, and even wore different perfumes. 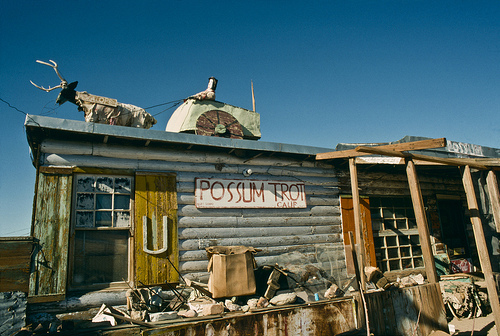 After the Blacks died, Possum Trot sat in abandon until eventually it was torn down and many of the dolls were handled by art collectors. The troop of dolls outlived their creators and lead a very different lifestyle from their days spent singing at the dusty desert outpost. Just last year, one of Calvin's sold for over $80,000.